Welcome to the first installment of act two of author Ted Scofield’s series on everybody else’s biggest problem but your own. If you missed one or more of the previous installments, you can find them here. In Act One of the greed drama, we first examined fascinating data that consistently show that, collectively, we channel Bernie Sanders, emphatically believing that greed is a major problem in our nation. But, at the same time, individually it is not our problem. Multiple data sets confirm that a healthy percentage of us admit to anger, lust, laziness and a host of other frailties and vices. But greed? No way. Not happening. Not me. We point the finger at the other guy; greed is Everybody Else’s Biggest Problem. We next explored a rationale for this remarkable disconnect. Denial is the oft-cited explanation, but we took a step back and concluded, after discussing nine commonly cited attributes of greed, that denial of greed is not the malfunction. The issue is a fundamental inability to define greed. Simply put, which is tough to do after six months of analysis, we do not deny greed; we don’t know what it is. As a nation, as a culture, as a society, a workable, collectively applicable definition of greed eludes us. In Act Two of this challenging greed drama, we’ll look at Why? Why can’t we see greed in ourselves? Why can’t we articulate a functional definition of greed? Today we’ll clear the lowest hurdle. Why do we want to accumulate lots of money and possessions? Why do we think we need an abundance to be satisfied? The answer is obvious: Because we think money, and the stuff money can buy, makes us happy. Does it? My introduction to, and veritable obsession with, happiness research began in March 2010 with an article in The New Yorker – cue my family’s and friends’ knowing and slightly annoyed nods. The article summarized a famous 1978 study published in the Journal of Personality and Social Psychology. The researchers assembled three groups of people – major lottery winners, paralyzed accident victims, and a control group of random individuals – and asked them a battery of questions about their present, past and future happiness. When the psychologists tabulated the answers, they found that the lottery group rated winning as a highly positive experience and the accident group ranked victimhood as a negative one. Clearly, the winners realized that they’d been fortunate. But this only made the subsequent results more puzzling. The winners considered themselves no happier at the time of the interviews than the members of the control group did. In the future, the winners expected to become slightly happier, but, once again, no more so than the control-group members. (Even the accident victims expected to be happier than the lottery winners within a few years.) Meanwhile, the winners took significantly less pleasure in daily activities—including clothes-buying—than the members of the other two groups. It’s shocking because it contradicts our society’s materialistic assumptions, but how can we ignore the hard truth: Once beyond poverty, further economic growth does not appreciably improve human morale. Making more money does not breed bliss. So what is this “comfortable standard” beyond which money won’t deliver the results we anticipate? Take a look at the chart below from David Myers. 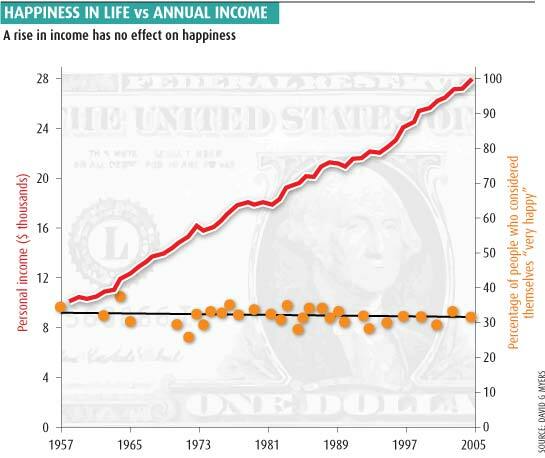 The red line is personal income. The orange dots are happy people. Take the case of Nigeria. The country’s per-capita G.D.P. last year was about fourteen hundred dollars. (In real terms, this is significantly lower than it was when the nation declared its independence, in 1960.) Yet the proportion of Nigerians who rate themselves happy is as high as the proportion of Japanese, whose per-capita G.D.P. is almost twenty-five times as great. The percentage of Bangladeshis who report themselves satisfied is twice as high as the percentage of Russians, though Russians are more than four times as rich, and the proportion of happy Panamanians is twice as high as that of happy Argentines, though the Argentines have double the income. A new study, which a guy my age finds quite depressing, reveals when we adults are happiest in life, and it’s when we’re in our early twenties. Happiness levels then decrease for roughly 40 years, increasing again around age 65. After their early twenties, “people are at their happiest again around the age of 80,” the researcher reports. Why? The study found that young and old people place less importance on “money and jobs,” the primary woes of that weigh heavily on working-age adults. Translation: In our competitive, keeping-up-with-the-Joneses decades, we aren’t happy unless we have a big house on the right side of the tracks. Most of our lives are spent in an infinite, angst-ridden loop of Pretty in Pink. Molly Ringwald’s Andie is ashamed and embarrassed by her small home, which the film makes clear is literally on the wrong side of the train tracks. “I don’t want you to see where I live,” she says defiantly to Andrew McCarthy’s wealthy Blane. Many of us whisper something similar to ourselves every day. So, what can we do with our money to increase our happiness? The answer may surprise you. In 2010, a social psychologist asked a group of college students what would make them happier, spending money on themselves or on others. The result is predictable – the group overwhelmingly said spending money on themselves would maximize happiness. Start giving your money and time away: New research shows you’ll be happier for it. Americans who describe themselves as “very happy” volunteer an average of 5.8 hours per month. Those who are “unhappy”? Just 0.6 hours. Another study found lower depression rates among Americans who donate 10% of more of their incomes. ‘Tis better to give than to receive, indeed. Absent poverty, accumulating money does not buy sustainable happiness and, paradoxically, giving money away is a path to subjective well-being. Decades of research from around the globe confirm it. But do you believe it? Does the consensus conclusion apply to you? I’ll speak for myself. I can’t help but think I am the exception to the rule. Surely I’d be happier with more money in my bank account. Surely I’d be a lot happier if I hit the Powerball. I bet you feel the same way. Are we all exceptions to the rule, equating our well-being with our net worth, despite decades of data disputing our delusion? I suggest we believe we are indeed exceptional, and our faith in money’s ability to buy happiness is one reason why we cannot admit to greed or articulate a functional definition of it, one reason why we can quickly pin the dreaded greed label on others, but so very rarely on ourselves. Greed is B-A-D. If we’re convinced accumulating lots of money and stuff makes us happy, it can’t be greed. At least not when I do it. “Powerball current estimated jackpot: $1.5 billion.” To suggest that winning the lottery does not result in increased happiness (compared to non-winners) is definitely counter-intuitive. But I think humans quickly assimilate to a “new normal” and all of a sudden the extra money is “normal” and life’s ordinary problems return. Yes, I’m in the same boat as the author in that I believe I am also an exception to the rule and would be happier with more money in my bank account. I’m sure 99% of us are. Great post and series! I always look forward to them.